Food bar 3600 total calories, Withstands temperatures of -40F to +300F, US Coast Guard approved, 5 year Shelf Life. 6 Pre-measured 4 oz air tight, sterilized packets. Withstands temperatures of -40F to +210F, US Coast Guard approved, 5 year Shelf Life. Compact, lightweight blanket 1 1/2 oz 52" x 82". Offsets hypothermic reactions, Retains 90% of body heat. 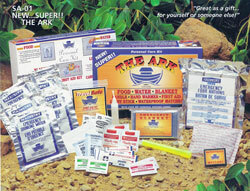 Super Ark Personal Survival Kit, With over 40 Personal Support items! 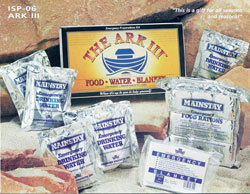 Contains - food, emergency drinking water, emergency blanket, candle, hand warmer, first aid, light stick, waterproof matches. Makes a great gift. 9 pre-measured servings can last 1 person for 3 days - 3600 total calories, Withstands temperatures of -40F to +300F, US Coast Guard approved, 5 year Shelf Life. 6 Pre-measured 4 oz air tight, sterilized packets. Withstands temperatures of -40F to +210F, US & Canadian Coast Guard approved, 5 year Shelf Life. Compact lightweight blanket, Flexible space-age material 1 1/2 oz 52" x 82". Offsets hypothermic reactions, Retains 90% of body heat. Safe and easy to use hand warmer, Self heating for continuous warmth. First Aid Kit -40 pieces. Package of 50 waterproof safety matches.